A very romantic proposal took place a few weeks ago, right smacked in the middle of wedding proposal season! Elias decided to pop the question to his girlfriend Liliana while they were on a trip attending a friend´s wedding in Los Cabos!! The romantic mood was on and the setting couldn’t have been more special and un-expected! Elías secretly asked me to rent a beautiful 31 ft Sea Ray Yacht and to assist in the planning of a snorkeling trip in the pristine Cabo Ocean. He wanted the boat to offer its regular service and only have casual snacks and drinks aboard, like chips and beer, so not to provoke suspicion. However, two bottles of champagne and a beautiful flower bouquet were hidden in the boats cabin; Liliana had no idea what was about to happen. The boat sailed to the cozy bay of Chileno, the perfect place to snorkel and enjoy the warm Cabo waters .They put their fins and mask on and staff members from Baja Outback guided them along the best snorkeling spots and eventually to the shore. The treasure hunt began. A bottle with a message inside was given to the soon to be bride with the first clue that led her to a small mountain right next to the beach. There she had to find a shell with another message inside which read that she had to look at the end of the cliff where a chest with a big crystal clear ring was waiting! Like right out of a movie! She found the chest and looked down to see a large banner with the words “Princess would you marry me?” held by camouflaged staff. Happy tears and celebratory screams began followed by champagne served right there, on the spot! Beautiful pictures of the happy couple with the Cabo sunset and an amazingly romantic proposal made this an unforgettable day! 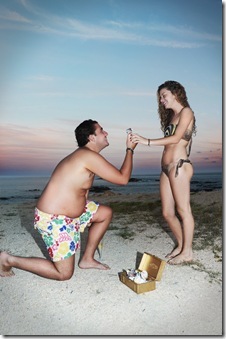 What a an amazing way to propose! Unique, flawless & romantic weddings!